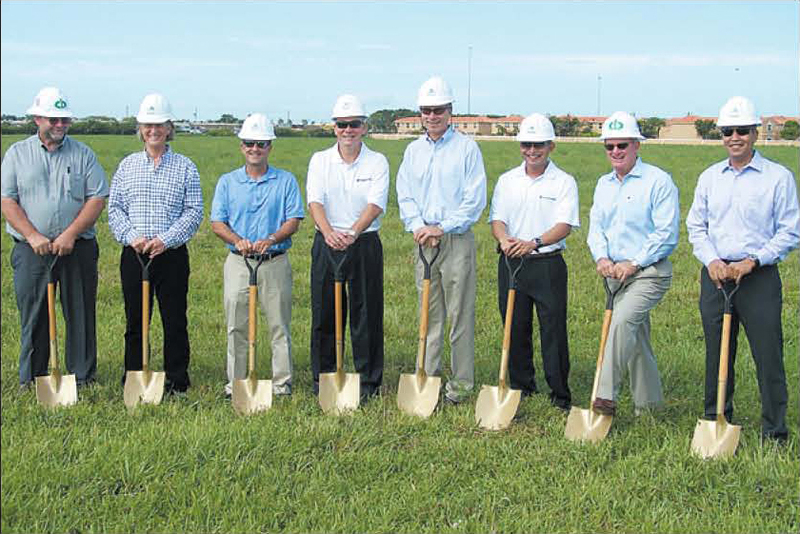 MIAMI LAKES, FL., July 18, 2011 - The Graham Companies, developers of the original planned community of Miami Lakes, has broken ground on its latest residential apartment neighborhood, the Residences at Lakehouse. The 270-unit luxury development will be built on a 20.9-acre site along Commerce Way west of N.W. 82 Avenue in the southwest corner of Miami Lakes. Lakehouse will feature all two story buildings nestled around a 1.25-acre lake. Floor plans will offer 36 1-bedroom units, 180 2-bedroom units, and 54 3-bedroom units. Twenty-six of the units will be townhouses with attached garages. All of the apartments will have luxury finishes including kitchen and bathroom granite tops and wood laminate floors. The design of Lakehouse was created by Coconut Grove architect Roger Fry who also designed three other apartment communities for The Graham Companies including St. Tropez, Crescent House and Fountain House II. The Lakehouse site plan also includes a luxurious pool area, a fitness center and a dog park. Construction financing is being provided by Miami Lakes based BankUnited. “We are really excited to support a project like this,” said Nic Bustle, senior executive vice president of Corporate and Commercial Lending for BankUnited. “We are happy to demonstrate the support for the community with financial projects like this.” Construction was scheduled to begin on August 1 by the project contractor, CB Constructors, a division of Current Builders. The first units are expected to be available for rent around May of 2012, with final completion scheduled for December 2012. For more information, contact The Graham Companies residential division at 305-821-1130, or visit www.miamilakes.com.